Posted by In a post a little while ago, I covered how to properly butter cream and crumb coat a cake so its good to go for decorating, or for tossing on a fondant layer and decorations.. you can read it here. I did up that post as I was test-baking a cake for a baby shower and I wanted to see if the recipe needed tweaks no not... and I figured doing a step by step "how to" from baking to crumb coating, to fondant-ing a cake would be a marathon of a post, so I left the how to fondant a crumb coated cake and decorate it with fondant ribbons, bows and owls (theme of the baby shower) for this post.. on we go! So, in my test cake version, I used soured milk (milk + lemon juice) instead of butter milk resulting in a cake that was fluffy, a touch on the dry side and baked up nicely about a good 1.5 inches in height. For the baby shower cake, I used full fat buttermilk like the recipe asks for resulting in a cake that had a moist tender crumb, slightly more yellow in color, lots of random holes, but baked up a lot denser - about 1 inch in height... flavor wise, buttermilk was the way to go, despite resulting in a shorter, stumpier cake. 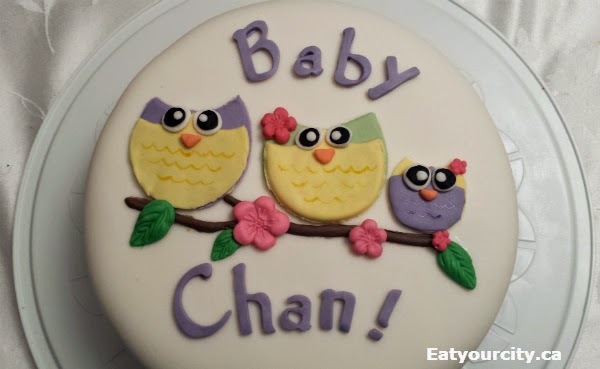 How to fondant a cake! 1) After you have evened off the tops of your cooled cakes, crumb coated and buttercreamed your cake (see how here in previous post), you're now ready to fondant and decorate your cake! 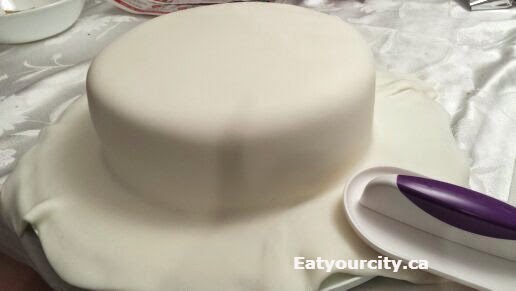 Roll out your fondant to 1/16" to 1/8" thickness... for large cakes, using a large fondant rolling pin is a life saver. The thicker the fondant, the more you use, but the more you can stretch it before it rips. (I cheated and used store bought fondant this time... if you want tastier fondant, you can make a marshmallow fondant instead - recipe and how to here). The fondant roller guides (they look like elastic bands) are a good way to keep your entire fondant layer even (not thick or thin in places) as you roll it out. Usually you need to roll out a diameter of the cake height, plus the cake diameter plus an extra inch or 2 for safety margin. I always roll out a lot bigger fondant circle than I need cuz I'm paranoid. After rolling out the layer of fondant, as it was so big, I simply used the Wilton fondant mat I had rolled the fondant out on, and flipped it directly onto the cake, peeling it off after. 2) Next, gently pull the fondant outwards and downwards to get rid of excess fondant and funny wrinkles. I liked using a Wilton fondant smoother to not only press the fondant smoothly into the sides of the cake... I used it to gently smoosh the cake into a more uniform shape as I must have evened the cake or butter cream laryers... unevenly lol! 3) Next, trim off the excess fondant with a sharp knife or scalpel like tool I found in the wilton fondant tools set. Smooth out and press in the bottom edges with the Wilton fondant smoother (finger tips work, but leaves noticeable dents). Next up, wearing disposable gloves so your hands and fingers don't look like a paint explosion after, grab a small chunk of white fondant and add in toothpick scooped out amounts of Wilton fondant gel coloring and knead like crazy to get the color all even (a little of the gel goes a long way!). Its more economical and easier to get the exact shade you want using gels rather than buying pre-colored fondant. I wanted a purple ribbon, so I rolled out a long strip of fondant (shape into a 1 inch thick "snake" so you don't have to roll out a huge amount of fondant) and using the guide on the fondant mat and the scalpel like tool, cut out a nice long 1inch in width ribbon (or however wide you want your ribbon to be). 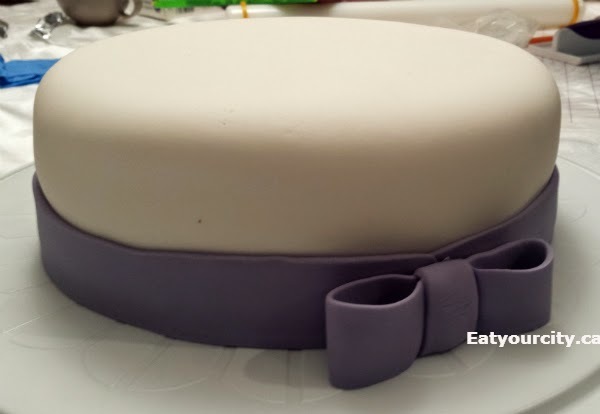 You may need to slide the ribbon of fondant off the mat onto a clean, lightly powered sugar surface to make a ribbon long enough to encircle the cake. Pop it on the cake and press it in with the Wilton fondant smoother.. it will stick on its own! 5) Next, you can decorate however you like... I forgot to buy some circle cookie cutters, and used heart shaped ones as well as random bowls and lids in my kitchen to cut out owls. Next time I'll buy some fondant punches and circular cookie cutters so the edges look neater. I used food safe pens to draw in the feather details. For the letters, around 2am I realized instead of painsakingly taking out the fondant letters out of the Wilton fondant and gumpaste letter silicone molds with tools, I could have just popped them out of the soft molds like icecubes, I finished up the letters pretty quickly. The branch, flowers and leaves, I used a Wilton fondant and gumpaste silcone mold. 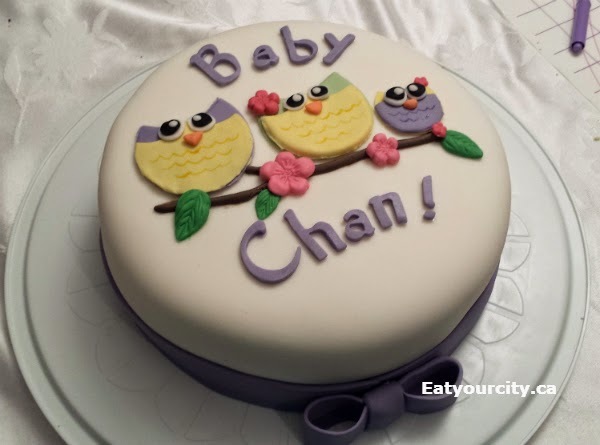 The silicone modes worked really well, if your fondant is on the sticky soft side, you need to lightly powder sugar the molds, otherwise, the fondant came out really easy. I delierately left out the milk from the buttercream, so this cake was good to sit pretty covered in the extra large cake carrier on the counter for a few hours until the baby shower! I could have used a normal cake carrier as the cake layers were thinner with the buttermilk, but I wasn't about to transfer it now lol! Sleepy time! I still had to get up in a few hours to make some Chai latte cupcakes and decorate them to look like owls and make about a hundred tea sandwiches... I'll cover cupcake fondant toppers in a separate post for decorating cupcakes. White and chocolate cake recipe - modified from Add in a Pinch's Best White cake recipe. My girlfriend wanted both a white and chocolate cake, so after I dumped in 2/3 of the batter into the pans (filling them about 3/4 inch thich full of batter), I mixed in 1/4 cup unsweetened cocoa for the chocolate layer. I also took out some sugar as I found the original cake waaay too sweet especially once you fact in the cakes will be covered in sugary butter cream. 1) Preheat oven to 350º F. Prepare three 9-inch round cake pans with parchment paper - cover the bottom and sides. 2) Cream together butter and shortening until light and fluffy with an electric mixer. Slowly add sugar one cup at a time, making sure to fully incorporate each cup before adding another. Add eggs one at a time, making sure to fully incorporate each egg before adding another. 3) Sift together flour, baking powder, and salt. Pour milks and vanilla into measuring cup and whisk together with a fork. Add to butter and shortening mixture alternately with milk mixture, beginning and ending with dry ingredients. 4) Gently stir all ingredients until well combined. Stop mixer and scrape down sides and bottom of bowl, making sure to have all ingredients mixed well. 5) Evenly distribute about 2/3 of the cake batter between 2 cake pans. Mix in the cocoa powder into the remaining 1/3 of the batter, then scoop into remaining pan. Place pans into oven (rack should be 2/3 of the way up in the oven). Bake for 25-30 minutes, or until a toothpick or cake tester inserted in the center comes out clean. Remove and allow to cool slightly in cake pans for about 5 minutes, then cool completely on a wire rack.